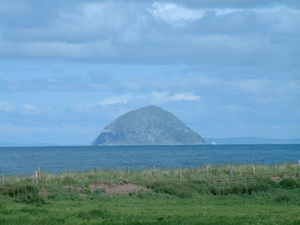 The understated splendour of the South Ayrshire coast remains one of Scotland’s best kept secrets. Look beyond the famous golf course at Turnberry (middle left) and you won’t find many tourists taking in the wild views (lower left). 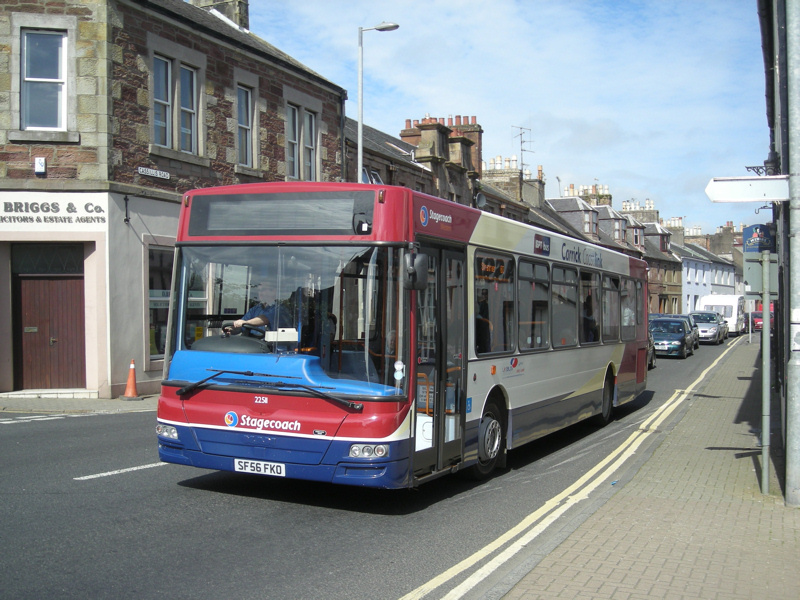 So it was a pleasant surprise when the main bus service through the area from Ayr to Stranraer was upgraded with a fleet of new vehicles in early 2007. 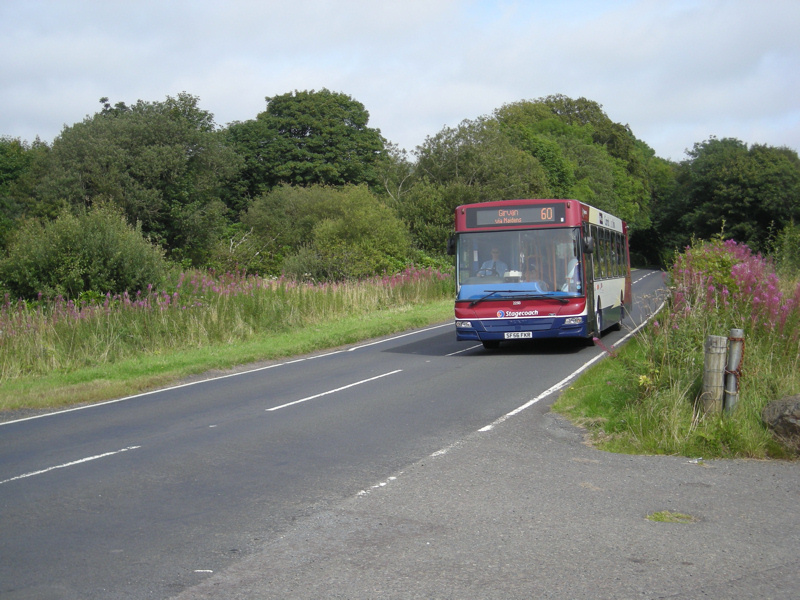 Traditionally this route was part of the trunk (3) Glasgow to Stranraer via Ayr service operated by erstwhile Y-Types and T-Types during Western days, and more recently by indestructible PS-Type Volvos from Stagecoach. 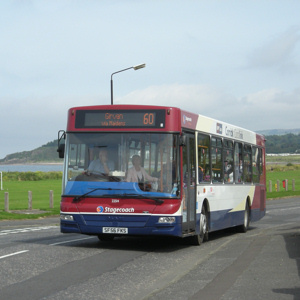 Nowadays the rugged route starts at Ayr (top left) but extends beyond Stranraer to the quaint fishing village of Porptatrick (above) and consists of a set of interworked services numbered 58/358 and 60/360. 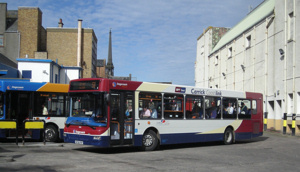 The new buses are nine East Lancs bodied MANs, an unusual purchase for Stagecoach, and even more unusually painted in SPT (Strathclyde Partnership for Transport) livery with Carrick Coast Link lettering. 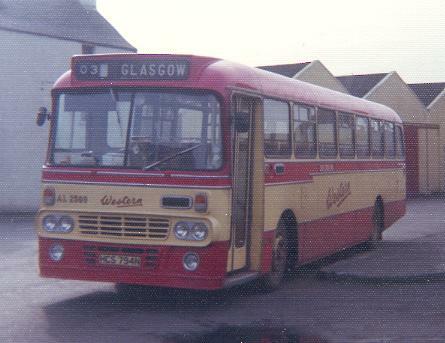 They are allocated to Ayr and Stranraer depots and can be seen on any hair pin bend or any brow of a hill between the two towns. Sunny new vehicles for a sunny old route. xxxxxxxxxxxxxxxxxxxxx All photos taken in August 2007. Click to enlarge. 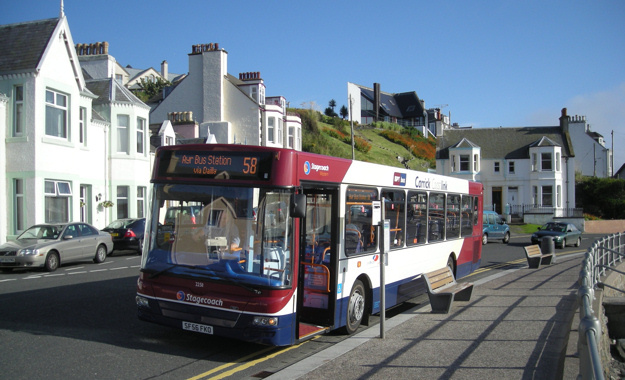 The route from Ayr to Stranraer was extended to the seaside village of Portpatrick in the early 2000s. 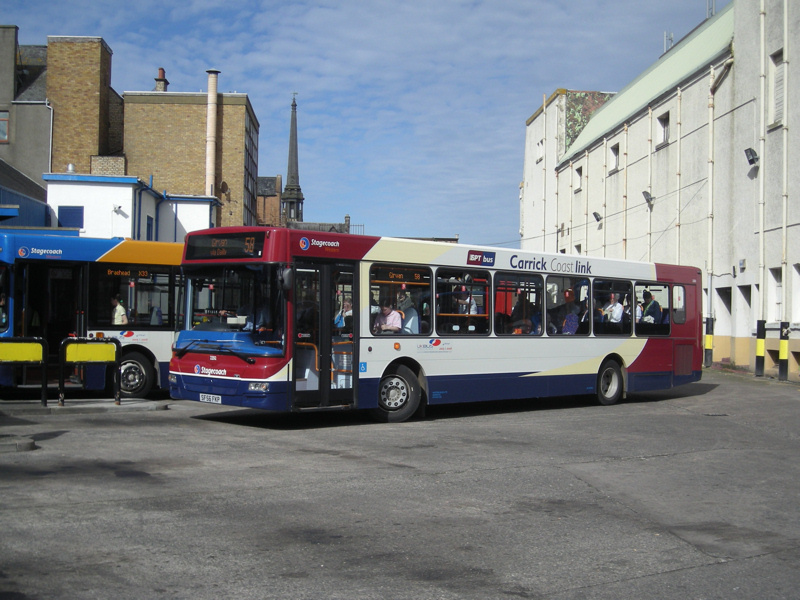 22511 (SF56FKO) is seen there on an early evening service. 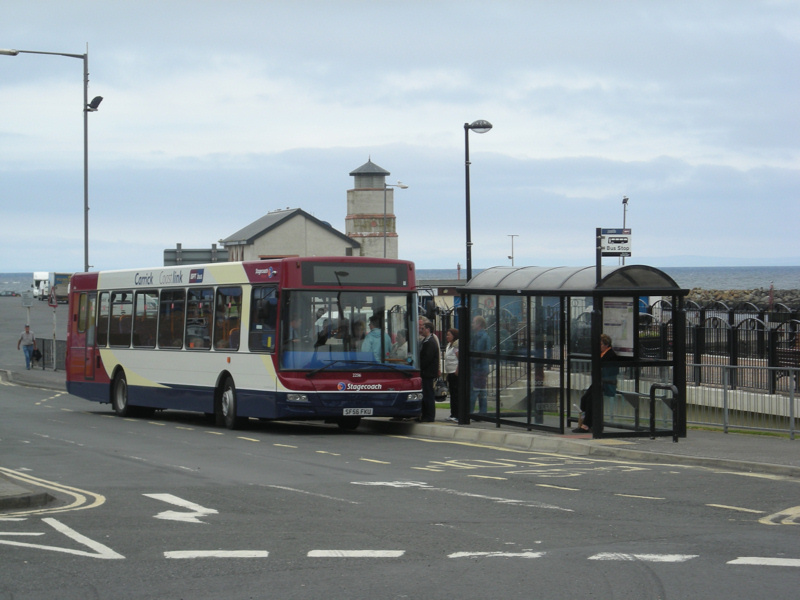 Ayr bus station is always recognisable by the distant church steeple and the Mecca bingo hall. 22512 (SF56FKP) departs for Stranraer on a sunny evening. 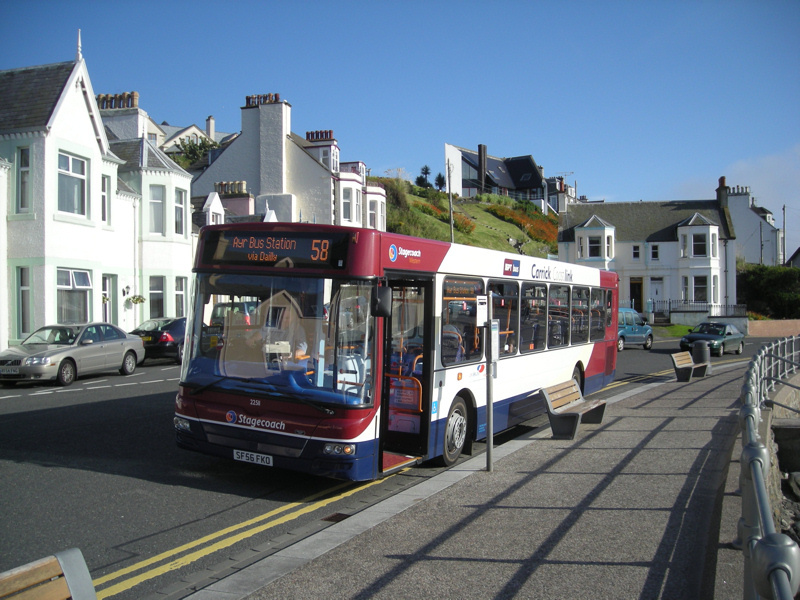 22514 (SF56FKS) speeds through Maidens heading south for Turnberry which is famous for its spectacular golf course that regularly hosts the British Open Championship. 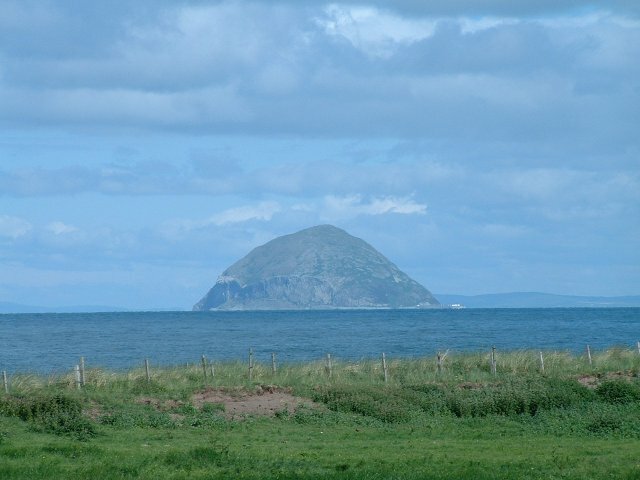 Omnipresent along the Ayrshire coast is Ailsa Craig, an ancient dormant volcano in the Clyde estuary. The road between Ayr and Maybole was drastically improved in the early 1970s to eliminate the worst of the hairpin bends. 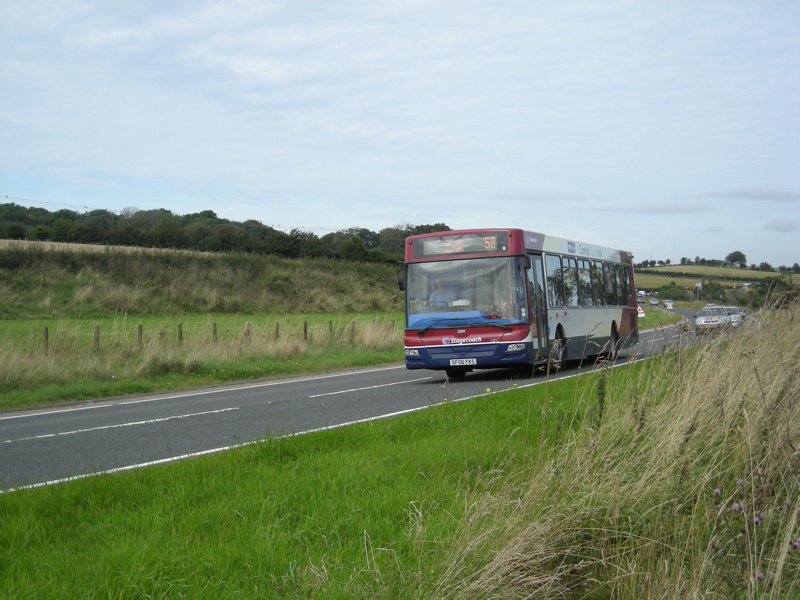 22514 (SF56FKS) heads for Maybole from Minishant on one of the upgraded sections of carriageway. 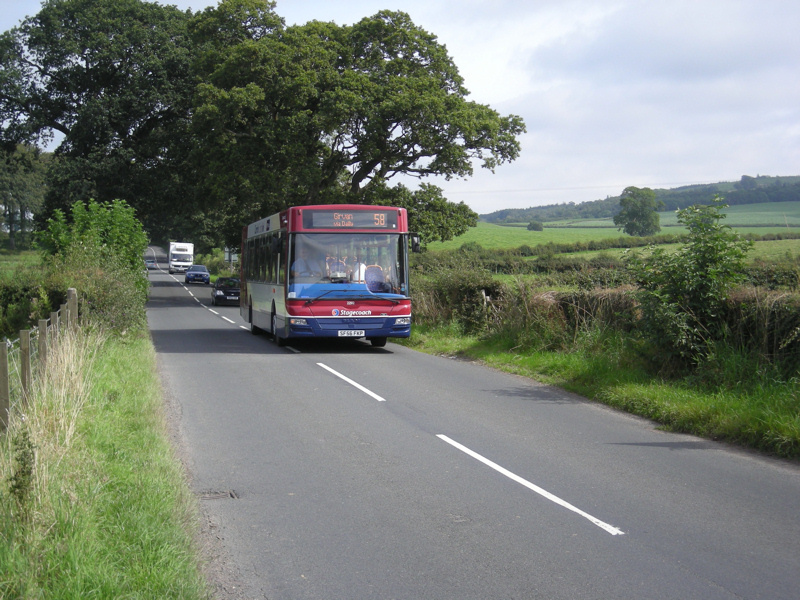 The 360 variant of the route passes Culzean Castle (pronounced Culain) where 22513 (SF56FKR) is seen. 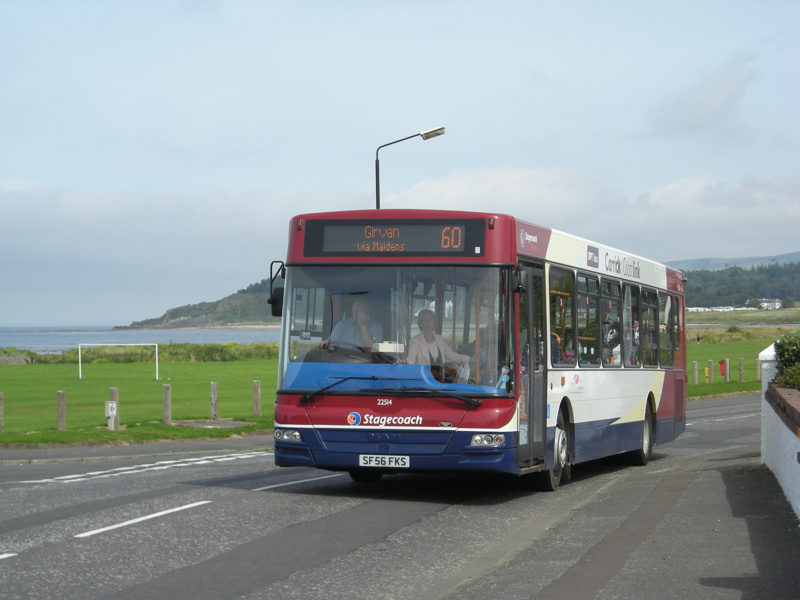 Ballantrae is the only significant settlement along the 30 mile stretch of coast between Girvan and Stranraer where 22510 (SF56FKN) is seen heading south to Stranraer. 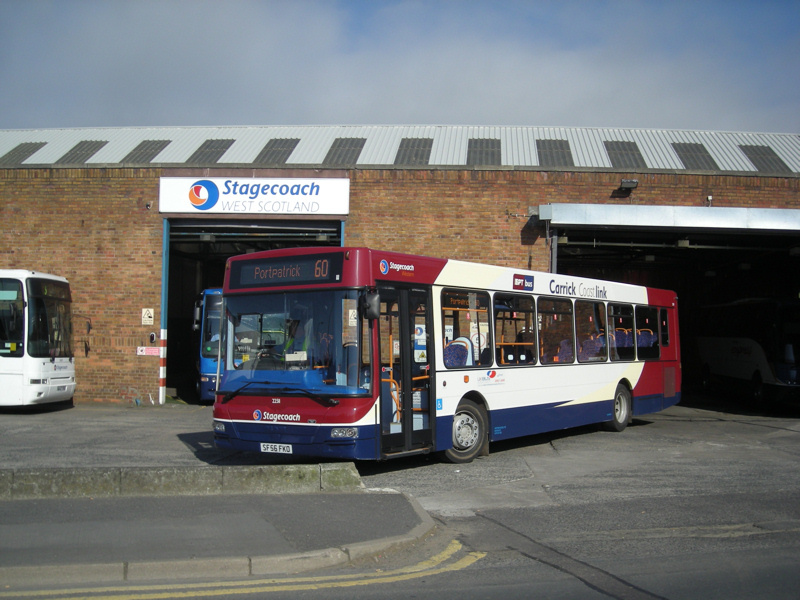 As with Ayr bus station, Stranraer depot hasn't changed much in years. 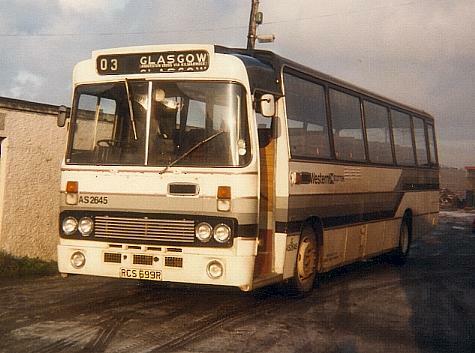 Lewis St. is where 22511 (SF56FKO) is seen being fuelled en route to Portpatrick. 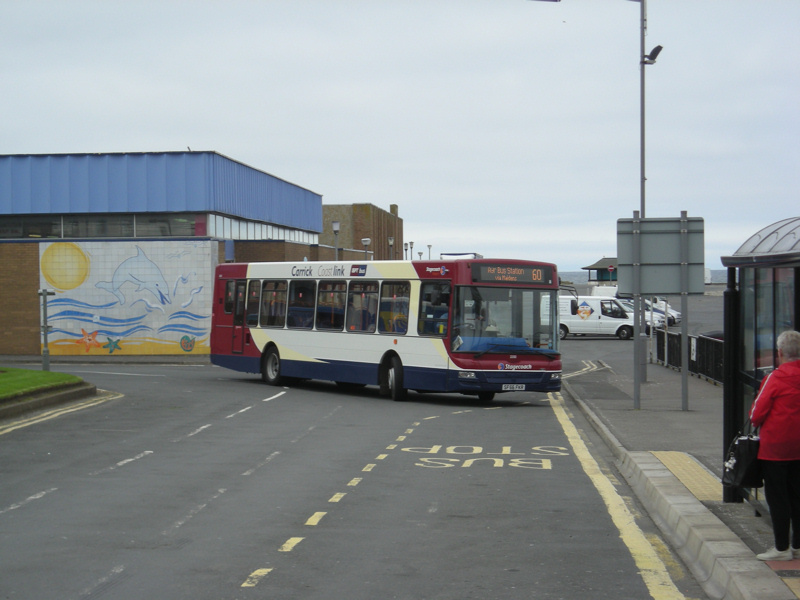 22513 (SF56GKR) seen swinging past the swimming pool at Girvan harbour on a 60 service to Ayr. Girvan harbour is a picturesque setting - when it is sunny. 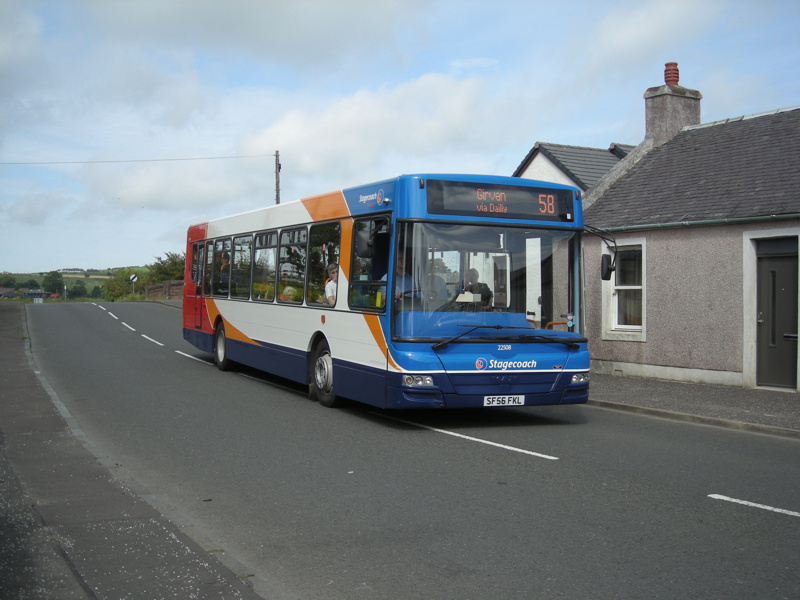 Here 22516 (SF56FKU) is seen picking up a good load at lunchtime bound for Stranraer. 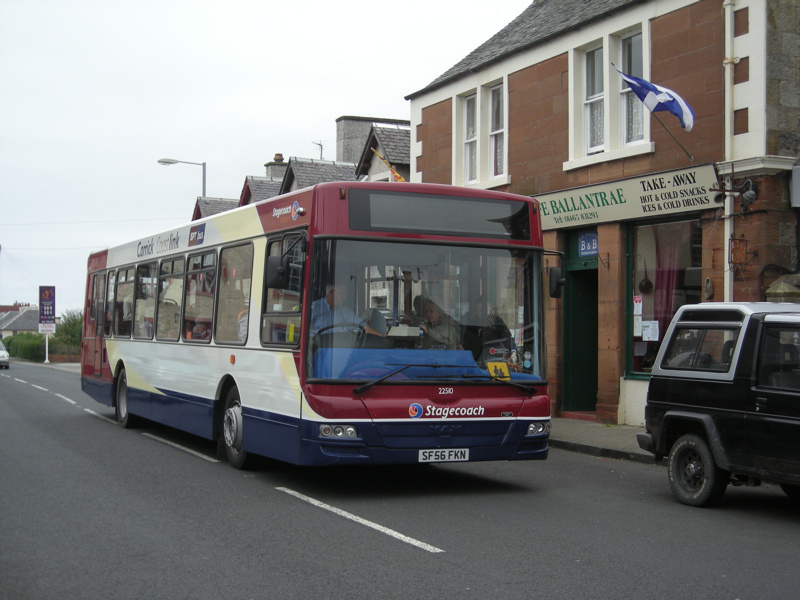 Maybole is the setting for 22511 (SF56FKO) on its way south.